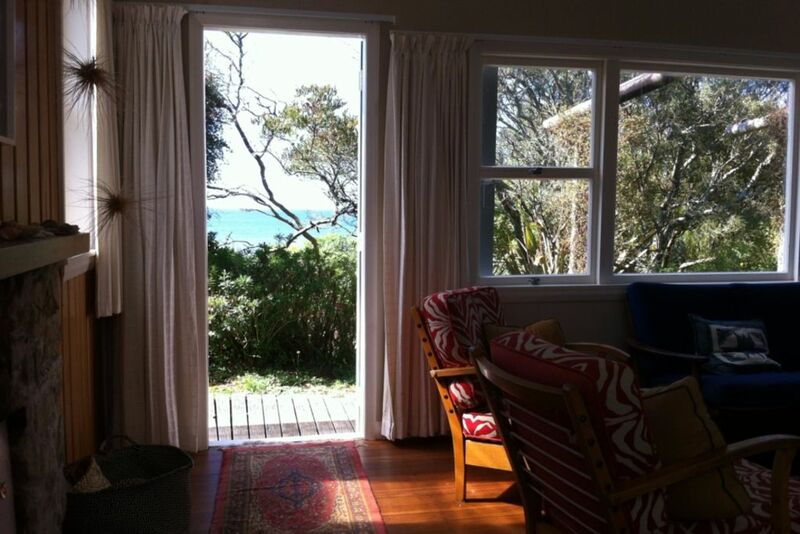 Our beachfront house is a 1960's open-plan design with oiled timber floors.It is lovely when it is warm and cosy when its raining. There are views straight out to the beach and up to Farewell Spit. The beach is soft and sandy, with a shallow gradient so very safe swimming and good for kayaking. Native trees around the house invite tuis, wood pigeons and shining cuckoos... The living room opens onto a deck and the garden has sheltered spots so there are nice places for reading or relaxing. A tennis court and cafe are 2 minutes walk away. Collingwood is 15 minutes drive for groceries, a local museum, or fresh fish 'n chips at the Pub. Farewell Spit is 15 minutes drive, and Wharariki beach a further 5 minutes, through to the west coast. The Whanganui inlet is 15 minutes drive and you can continue down the west coast to Maungarakau Swamp Cafe, Patarau River, Anatori river and beyond. The Aorere Valley which ends at the start of the Heaphy Track has the Kaituna Walkway and Naked Possum Cafe, Devils Boots, goldfields, and the Bainham Shop. During NZ school holidays - 4 night minimum booking applies. For long weekends - 3 night minimum. For high season a minimum of 7 nights or less by arrangement. Otherwise a minimum of 2 nights. I live in Wellington with my husband. Our 3 boys have all enjoyed holidaying at Pakawau. A view to the sea without other houses in sight. The garden has native trees and birds and you can hear the gentle lapping of waves at night. The house is a very modest simple 'mid century modern' style. The property is close to Farewell Spit, Wharariki Beach, Whanganui inlet, the West Coast and Aorere Valley so excellent opportunities for walking very beautiful surroundings. A view to the sea, with some trees to look through. A long view to farewell spit. The beach is at the bottom of the garden.To walk from the house to the beach takes 1 minute if you are walking slowly. The garden slopes with a lawn and trees giving pockets of shelter. A great location all round, and a comfortable property. Clean tidy easy place to stay. Shop at camp ground just down the road makes it easier. The beach so close was a delight for kids. Add a small wood burner and some more water pressure for shower and I would come back and not want to ever leave. Still really great third time, and excited to return. Classic Kiwi bach in a superb location. (The only modest criticism is weak shower pressure). Such a relaxing place to be. Love spending my time there . Great place to stay and unwind. Farewell spit is 20 minutes drive. You can walk along the inland (for the birdlife) and ocean side of the spit. Wharariki beach is about 10 minute drive beyond farewell spit. Spectacular - but not on a windy day! Beautiful Kaihoka lakes, nikau forest is about 20 minutes drive turning left at the Pakawau hall and heading west over the Westhaven inlet. Continue down this road further to the Maungarakau swamp cafe, Patarau and Anatori River. All stunning west coast environments.